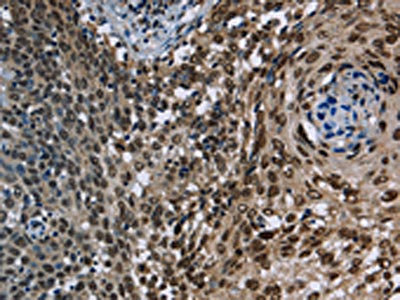 Immunohistochemistry of paraffin-embedded Human cervical cancer tissue using KDM3B Polyclonal Antibody at dilution 1/40. JMJD1B (jumonji domain containing 1B), also known as KDM3B, 5qNCA (5q Nuclear Co-Activator) or C5orf7, is a member of the JHDM2 histone demethylase family of proteins. Expressed in a wide variety of tissues, JMJD1B localizes to the nucleus and contains one JMJC domain and a C-terminal zinc finger motif. JMJD1B functions as a histone demethylase and, using iron as a cofactor, demethylates lysine-9 of Histone H3. This suggests that JMJD1B plays a central role in the histone code. The gene encoding human JMJD1B is located within the 5q region of the genome that is often deleted in myeloid leukemias and myelodysplasias. This implies that JMJD1B may function as a tumor suppressor of myeloid leukemia. Eptopic expression of JMJD1B exhibits growth suppressive activities, further supporting a role for JMJD1B in tumor suppression. KDM3B Polyclonal Antibody. Unconjugated. Raised in Rabbit.